Daily practicing of gratitude, affirmation and goals can help you be more happy and more focus on what you want to achieve in your life. One of the ways to do this is via a journal. In the past I’ve been journaling in my notebook, in a word document and in Evernote. I felt disorganized. 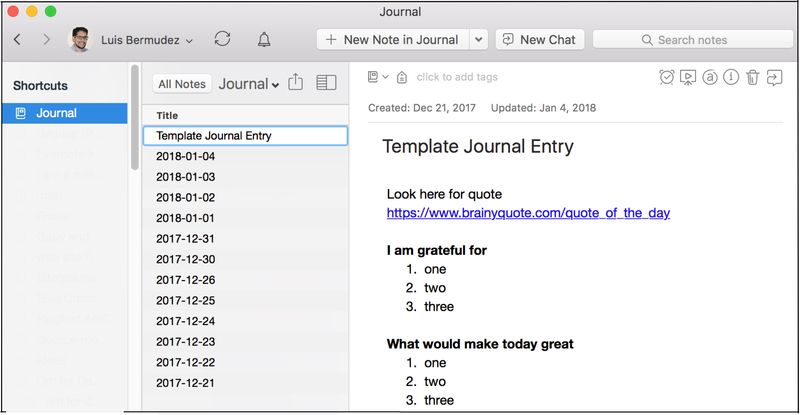 Over the christmas break I found a system that has been working for me only using Evernote mimicking the very successful five minute journal. I call it the four minute journal. I am enjoying it and I thought will be great to share. 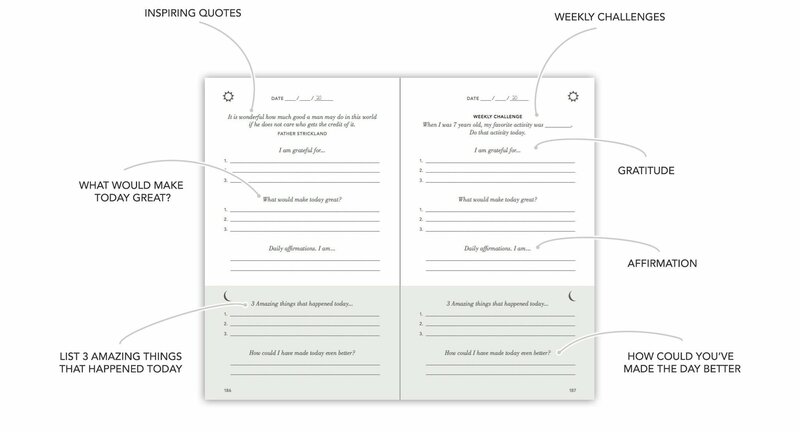 A great example journal is the Five Minute Journal from the Intelligent Change company. The journal contains all the sections I think are good to start the day with gratitude, affirmations and goals. This journal is great, but I travel a lot and carrying a paper journal is sometimes impractical. I am also an avid user of Evernote. So, I thought, well maybe I can mimic this great paper journal so it can work in Evernote. Here is how I did it. Create a notebook called Journal (Go to File / New Notebook). Add the Journal Notebook to shortcuts (Go to View / Notebooks and then right click on the notebook and select Add to Shortcuts). Create a template, called Template Journal Entry (check it out here to see it and download it). Copy it inside the Journal notebook. 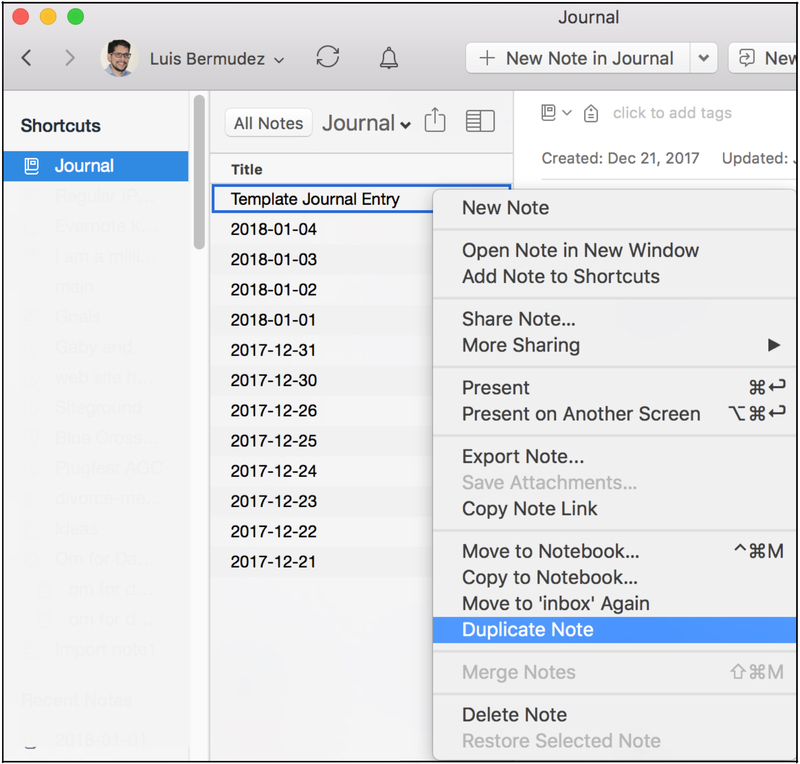 Duplicate the template note (right click on the Template Journal Entry note and select duplicate note). 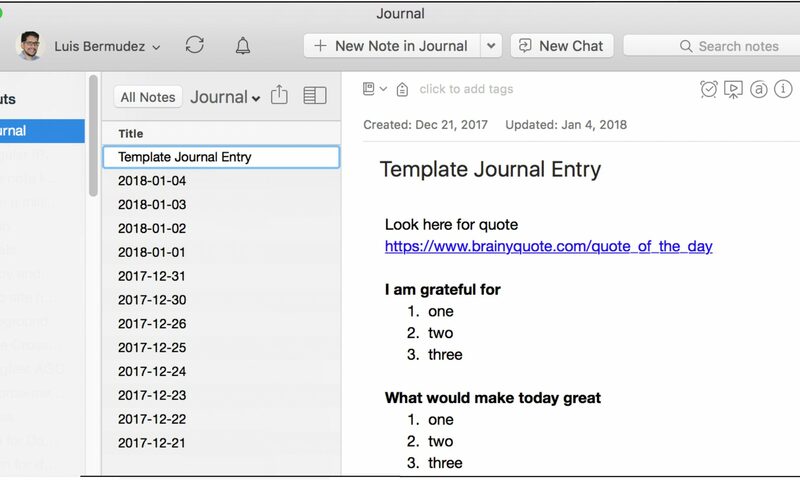 Open the new note with name: Template Journal Entry copy. Rename it to today’s date. I use the convention yyyy-mm-dd, since it will allow me to order the nodes by Title. Insert an inspirational quote. I have a link in the template which helps me finding an inspiring quote that I can related at that moment. When I found it, I copy it in my note. Add three things you are grateful for. This don’t need to be the usual things (e.g. kids, job, home). I try to think about small things. Write your daily affirmation. I write this from scratch not looking at my vision statement or previous affirmations. It helps me reorganized and tweak my vision. Write 3 things that will make your day great. I think about this as three achievements that can get closer to my most important goals. Move excitedly to your other daily tasks. I hope you find this post useful and will help you with your morning routine. Happy New Year 2018! I was listening to the Tim Ferris Podcast interviewing Dr. Michael Gervais, who is a high performance psychologist. About 50 min into it they started talking about visualization, which Dr. Gervais refers to it as imagery with goes beyond visualizing. He talks about creating an electric charging moment where we not only see what we want to achieve in full color, but feel it, hear it and smell it. How to do that? Minimizing distraction and training to improve creating those imageries. Mediation, I think is the way to do it. 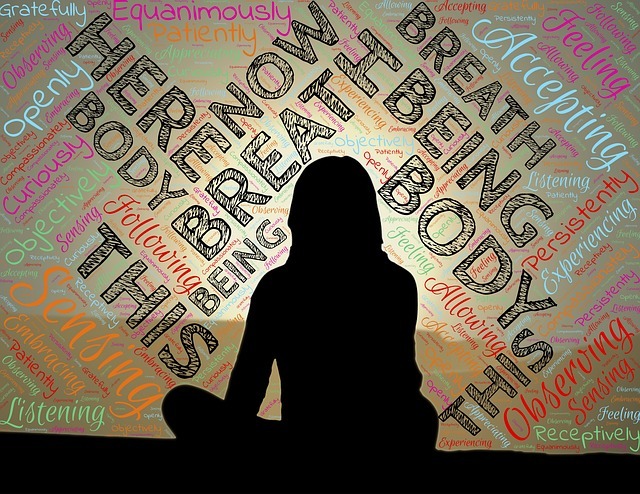 I personally like Sadhguru mediation practice (Chit Shakti) that helps you visualize your goals in the short, medium and long term. I&apos;ve being doing this mediation for almost 2 months. He talks about sensing joy when you feel your dreams being accomplished. He also mentions, as part of your visualization, experiencing the well being that is spread around including everyone as part of your goals. It seems to me like a great focussed life purpose, which is ultimately serving others. For example, one of my short term goals is to improve my mother&apos;s well being. I envisioned she saying thank you to me because I found her a nicer place to live with a pleasent view with tall big trees in a place where she can walk peacefully. I imagined she is hugging me while we are sitting together in the living room looking at the branches playing with the wind. I feel her closeness, gratitude and peacefulness. I wake up and drink 1/2 litter of water. I go to my living room and place a yoga matt or sleeping bag on the floor. 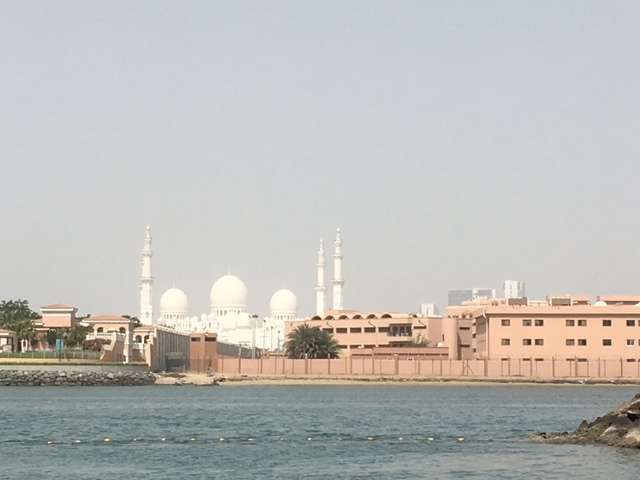 I place a small cushion on top of the mat and put myself looking east doing a half lotus position, putting my back straight and lifting my head a little bit to the sky. I put my hands looking up resting in my tights and do a Gyan Mudra. The tips of my index and thumb are slightly touching while the other 3 fingers are bended and closed together like making a container form. I do deep breathing for 5 minutes. I inhale feeling my lungs and counting 10, then hold for 3 seconds, and exhale for 10 counts all through my nose. I do 3-5 minutes of gratitude about big things and little things. For example, God thank you for the house that I live, thank you because someone help me at the metro, thank you because I found a parking lot near the entrance of the gym, etc. I do the Sadhguru guided mediation to visualize, feel, touch my goals for 2, 5 and 10 years. At the end, I think about what I will accomplished on my day and how I can improve (e.g. forgiving somebody that hurt me). This practice takes me 30-40 minutes. I feel great and experience that I&apos;m more aware and conscious about my dreams during the day than when I visualize them on my phone, a paper or board sporadically. It also helps me start my day connecting to God and experiencing gratitude. Yesterday I attended church at the Seneca Creek Community Church. The message was very practical and resonated with lots of habits some great people I think already have in place. Mark, the pastor based his talk on Michael Frost’s book called the Five Habits of Highly Mission People. The whole point of the book was to provide strategies for living “questionable” lives to inspire others to find God. Here is my practical take on it, which is independent and doesn’t assume that you believe in God or not. For sure these habits will make us become better every day. Do acts of kindness helping others without expecting anything in return. Give. A gift is an act of thoughtfulness and love. Eat: Eat with others. It reminded me of the book by Keith Ferrari “Never Eat Alone: And Other Secrets to Success, One Relationship at a Time“. Plan in advanced breakfast, lunches and dinners when traveling to meetings. Go to places where you can meet with others. I have met people at a Whole Foods in San Francisco at lunch time when I go attend meetings at the Moscone Center. In busy meetings, this place is packed and you need to share a table. Is better to learn from others while you eat. Listen: Stop and Listen. The need for listening is why mediation is so important. Ideas don’t come when we are busy thinking. Pray, think about a problem and sit in silence. Schedule it: The trick is to put in the calendar. I do it as soon as a wake up, maybe for 20-30 minutes. I need to go sleep around 10 the day before, so I can wake up between 5 or 6. This means cut TV or others distraction before going to bed. Channel it: I like the affirmations strategy by Jack Canfield. He tells that an affirmation needs to be concrete. For example: “God is my unlimited supply. May large sums of money come to me quickly and easily under the grace of God, for the highest good of all concerned, I’m easily earning Y doing Job Z“. He also suggests adding “this or something better” at the end. Why? Jack says: because Our rational mind is useful for strategic planning, but quite often God’s plans are a lot better than our plans ever could be. We need to listen to align with the plan God has for us. Learn: The book talks about learning about Jesus, which will help us act better think better, forgive others faster, etc. We need to grow or perish in our different dimensions. A way to grow spiritually is learn about Jesus and other great people. Reconcile with others. Make peace with others. Invite people to enjoy the beauty of the world. A great podcast that resonated with this idea, was the interview with Tim Ferris and BJ Miller. BJ Miller, who woks at the Zen Hospice Project shared his insights about the approach to mindfulness and how to look at art. 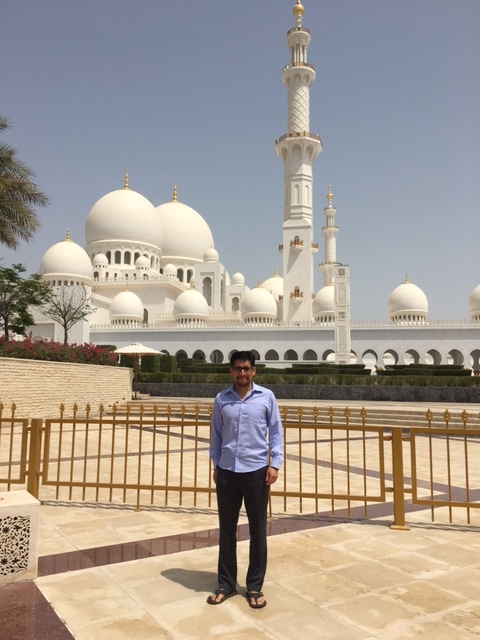 I hope this blog is useful and inspires you to become great! God Bless you! I have found that board games are one of the best activities to spend time with your kids. It is a great time to talk about life in general, how their day went, who do they played with at recess, what they learned, and what it’s bothering them most. It is a great time to teach them to be patient and to stop and think about making decisions. My daughter is 5 years old and her favorite game is the matchmaking memory game. Cards are all placed facing down. Players take turns to pick two cards. If the cards match, the player picking the cards keep them. The player that has more matches at the end of the game is the winner. I try to play hard, to concentrate and to memorize the position of the cards. I repeat the name, the image and create a story around it. They are like 50 cards. It is hard to make a consistent story of the cards spread everywhere. The incredible fact is that she ends up wining most of the times without any effort of internal repetition or effort to memorize any card. This weekend I found the reason. When we were playing last Friday, she suddenly stopped and said she wanted to write something in her notebook. I said I was fine. While she was writing, I was looking at the cards trying to remember the images of the ones we had turn over in the last hands. Then she showed me the note and I understood why she wins most of the times. She really wants to beat dad. Her desire is so big she wrote it down “Win the memory game”. She showed the note to me with excitement and really meaning it. Her sparkling eyes told me everything. It is not about how hard you work and concentrate on the details of your job or work. It is more about your desire to be triumphant. That desire will overcome the obstacles, will bring all the energy needed to pursue your dreams, will make you concentrate on the important tasks, and might beat your dad in a board game. Take your goal and put all your desire on it, write it down, flip the cards and make it happen. You might guess what happened at the end of the game… I lost again! The book Think and Grow Rich by Napoleon Hill, written first on 1937, explained the importance of dreaming and having faith in your desires to become rich. An important part of the process is to see your goals 2 or 3 times per day and repeat daily affirmations to engrane in your subconscious mind your desired dream. This will connect to infinite intelligence and open your creative thoughts to get what you want. The Secret Film is great movie to better understand the science behind it. Most experts talk about how to materialize your goals in vision boards in physical means like cork or poster boards or even small cards that can fit in a wallet. This blog will outline the technique that have been successful for me to make available goals and affimations in a digital world. I wanted to be able to look ay my goals from my computer. I wanted to able to look at my goals from my phone, even when there is no internet. I found out that when I’m flying I have the time to mediate about my goals but there is no wifi. Also, some places are still disconnected from the cellular grid (e.g. Shenandoah Valley in VA, where I had great hike last year). I wanted to be able to keep track of the different revisions of my set of goals. I have being using Evernote since 2008 to capture ideas, meeting notes, important receipts, wine labels, scan business cards, etc. It synchronizes almost on real time and you have access to your notes in all devices or via the web site. If you have only one goal note , Evernote will work great. For me, having one note helps me laser focus on a particular goal, that I can also combine with one affirmation. 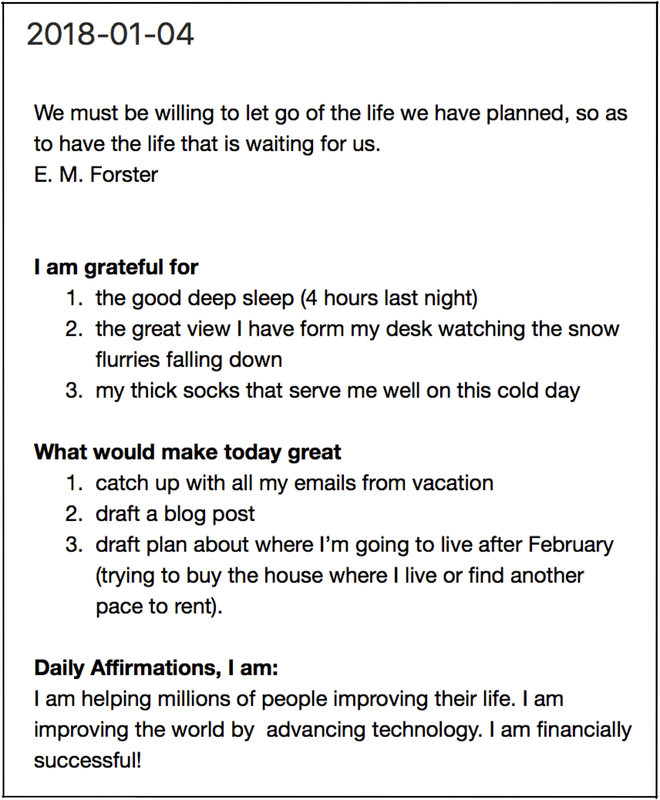 Create your goal with and affirmation as a note in Evernote. Create a shortcut based on that note. Here is a tutorial to create shortcuts. Put the shortcut on the top. Would love to hear is this works for you and if you have better ideas of how to put your goals and affirmations using other tools.